I had heard a lot about the famed Coastal Highway 1. American's love their cars and the 275 mile drive along the central Californian coast line provides a dramatic driving experience. 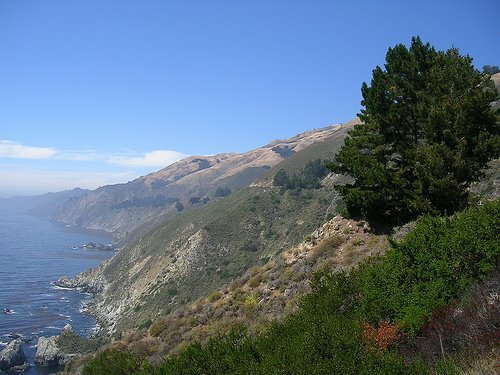 The views, particularly along the Big Sur are breathtaking, although having an attention span of a bowl of goldfish, one does get the impression that once you had seen one cliff, you had seen them all! Our road-trip started from Los Angeles driving north through the sprawling coastal town of Malibu, a beachfront community famous for its sandy beaches, and homes of the rich and famous. Mel Gibson, Britney Spears and Courtney Cox are all residents. 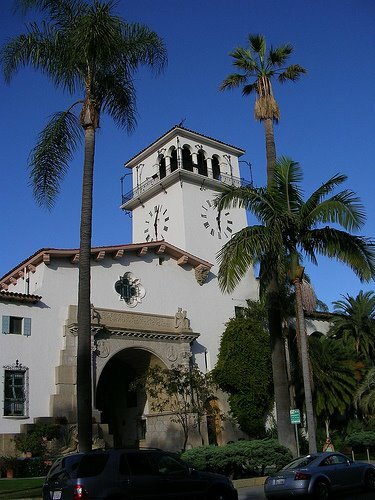 Ventura is home to the historic Mission San Buenaventura, one of the 21 missions to be found in the state, most of which are found along the slightly more inland El Camino Real (The Kings Highway) and at this point Highway 1 drives in unison with US route 101 - confused? Yes we were too. 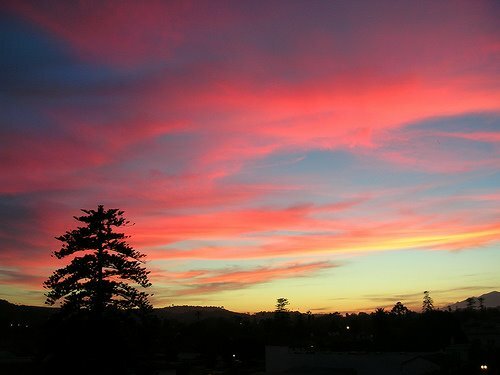 Just a few miles from here though is the oasis of Santa Barbara, which I fell in love with. We stayed a night here and I'm glad we did as we strolled along its Spanish styled streets with cutesy shops and trendy bars and restaurants. 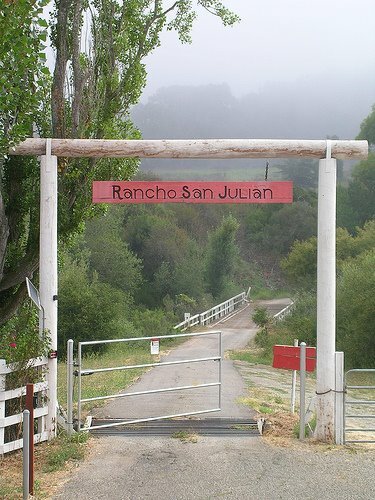 The Santa Ynez Mountains rise dramatically behind the city, with its Chardonnay and Pinot Noir vineyards thrust into the spotlight by the film Sideways. 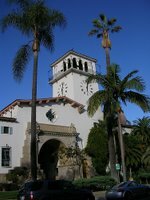 The Santa Barbara Courthouse (right) with it's clock tower, built in 1929, is worth a visit as is Stearns Wharf on the waterfront. We stayed in the beautiful Hotel Andalucia, complete with it's own roof terrace bar, where we gatecrashed into a birthday party, but as the Latin American band played and people danced, no one, let alone us, cared. The farmers market (every Tuesday afternoon) allowed us to stock up for our long drive the next day to our next stop 275 miles away at Santa Cruz. Up with the larks, we hit the road which took us past not very exciting towns such as Solvang, Lompac, which is dominated by the Vandenberg Air Force Base, home to the 30th space wing and Pismo Beach, the "clam capital of the world," before finally reaching San Luis Obispo. San Luis Obispo is roughly halfway between Los Angeles and San Francisco and one of California's oldest towns and the biggest on the central coast. It is also a big college town, but otherwise there isn't much else to say, although it is the original home of Jamba Juice. 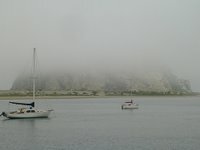 Further north of San Luis Obispso were the bays of Estero and Morro (where we stopped for a pee and thought we were in Ramsgate!). Cambria was next and the strange tourist attraction of Nit Wit Ridge, a house made out entirely of recycled materials. Honest. 40 miles further on we came across Hearst Castle, once the palatial estate of newspaper magnate and all round strange-one William Randolph Hearst. Orson Welles' film Citizen Kane was said to be based on Hearst's life. Located just north of San Simeon on a hill overlooking the ocean, Hearst Castle was home to all kind of shenanigans in its heyday of the 1920's & 30's but despite the fact that luminaries such as Charlie Chaplin and Winston Churchill used to hang-out there, a $24 entry fee made sure we turned around and carried on our way. 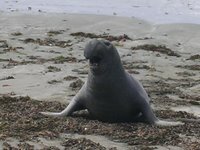 One place we did stop though was at Piedras Blancas, home to the largest colony of elephant seals in California. From the vista point you can watch these huge mammals wallow around on the beach yawning and swatting flies. These beautiful creatures nearly became extinct as they were killed for blubber oil but the law changed and there are today 8,000 elephant seals alone living in colonies here at Piedras Blancas. 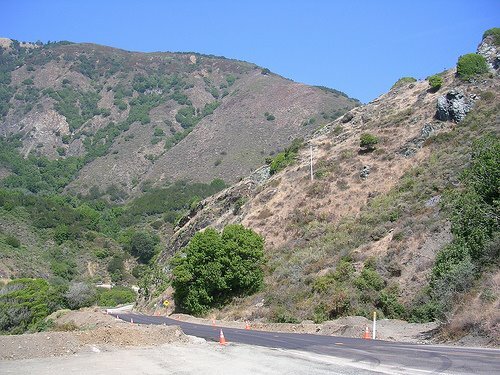 It's at this point that you soar about a mile into the sky driving around the narrow winding roads of the Big Sur. People had warned us of the traffic but no one had said anything about the fog, which sadly hindered what would have been pure 'kodak moments.' 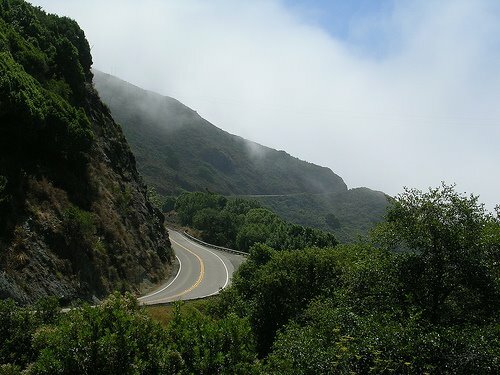 If you are going to drive the Big Sur, the best time to come is the spring or fall as winds from the northwest push the warm ocean surface water inland creating a heavy fog in the summer months. The Big Sur (el pais grande del sur) was originally inhabited by aboriginal Americans, then came the Spanish who named it. 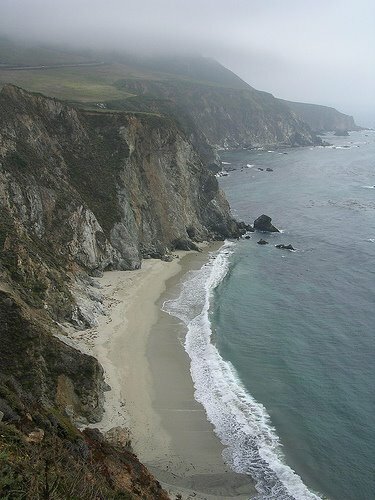 Along with the rest of California, Big Sur became part of Mexico when it gained independence from Spain in 1821, but after the American-Mexican war (1848), the Mexicans ceded California to the United States and the Homesteaders moved into the area. 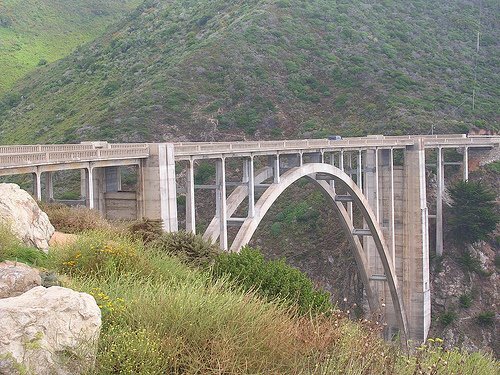 When Highway 1 was completed in 1937, it changed the area forever, although there is little development here, the highway unlocked what was once a very mysterious part of the country. As I said, my boredom threshold is not the best, but there were some magnifi cent vista points, none other than Bixby Creek Bridge (right). Said to be one of the most photographed bridges in the world, it is 714 feet long, 24 feet wide and has a main span of 320 feet. 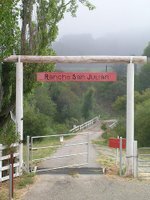 If you were thinking of staying in the Big Sur, then plan to spend some serious wedge and book early, there are two marvellous hotels on route, the Ventana Inn & Spa and Post Ranch Inn. What's that? $1,000 a night, well I did tell you. Back in the car and without a doubt this part of the drive is the best bit as north of the Big Sur, Highway 1 spills out onto the Monterey Peninsula, marked by Carmel at one end and Monterey the other. Carmel-by-the-sea, famous for Clint Eastwood once being its mayor, is so manicured that strict bylaws forbid neon signs, parking meters, billboards, hot dog stands and I love this one, a permit is required to wear high heels (damn!). 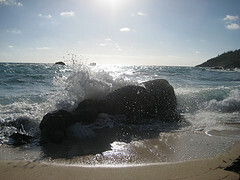 Wealthy, pretty and bourgeois are all words to describe Carmel, with its galleries, theatres, boutiques and restaurants. We decided against driving out onto the peninsula because of time, but the 17-mile drive from Carmel to Pacific Grove meanders (slowly) around golf courses (seven of them including Pebble Beach), beautiful bays, sea-life and other playgrounds for the rich and famous as well as the Lone Cypress tree - another kodak moment I missed. Historic Monterey is also known for it's marine-life with its kelp forests and is a haven for scuba-divers while strong rip currents attract surfers. 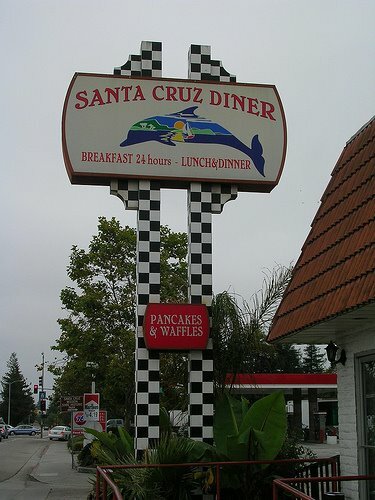 After a slow 9 hour drive, we made it to our next destination of Santa Cruz. In hindsight we probably should have tried to stay at bit further south but Santa Cruz gave us a good leg-up for the drive to the wine country the next day. Santa Cruz is a beach town full of surfer-dudes, home to O'Neill and reputed to be the site of the first surfing in California in 1885, when three Hawaiian princes surfed on locally milled redwood boards at the mouth of the San Lorenzo River. Of course surfing and the college population brings groups of unwashed kids in flip-flops and a few crazies. It certainly didn't have the charm of Santa Barbara but the main street of Pacific Avenue had a nice feel to it, including a very good restaurant that we ate at called Aqua Bleu. The 1915 boardwalk reminded me '60's movies and Dreamland in Margate. Other points of interest in the town is the mission, that's if you haven't seen enough already and the wharf, where you can watch the sea-lions. San Francisco got much of the world attention after the 1989 Loma Prieta earthquake, but Santa Cruz suffered extensive damage because the epicenter was only 10 miles north-east of the town. A lot of buildings were destroyed and 5 people were killed. 5 miles away is the much more affluent area of Capitola, home to many of the people who work in nearby Silicon Valley. We rested our tired heads at Chaminade, which was more of a conference centre than a home for weary drivers, but we slept well and I dreamt of cliffs and elephant seals.